Evasions, omissions and half truths -- the stock in trade of the Council on American-Islamic Relations (CAIR) -- abound in a recently issued document in which the group seeks to debunk what it describes as "Internet disinformation" about it. To set the record straight, the Investigative Project on Terrorism (IPT) has prepared a meticulous point-by-point 23-page analysis of CAIR's claims, challenging the group's typical CAIRlessness with the facts. To see the IPT Report, click here. CAIR provides a detailed and upbeat account of its own founding by Omar Ahmed and Nihad Awad, reporting that they left their respective jobs as president and public relations director of the Islamic Association of Palestine (IAP) in order to focus their efforts on a new group dedicated to "combating anti-Muslim discrimination nationwide." But the IPT rebuttal provides a less rose-colored view. It notes that IAP, the acknowledged former home of CAIR founders Awad and Ahmad, also was a founding member of the Palestine Committee -- an organization that an internal IAP report described as a Muslim Brotherhood creation "whose job is to make the Palestinian cause victorious and to support it with what it needs of media, money, men and all of that." The memo also called on Committee members to "increase the financial and the moral support for Hamas." In addition to spreading Hamas propaganda, the rebuttal observes, IAP helped organize multiple fundraisers that featured Hamas leaders along with songs and skits praising Hamas. The IPT analysis dismisses a defense raised by CAIR that cites retired FBI official Michael Rolince as saying in 2007 there were no "cold, hard facts" to support suspicions about the group. Rolince's quoted statement, the rebuttal notes, "is trumped by two recent letters from the FBI." One, from James Finch, special agent in charge of the Oklahoma City field office, reports that the Bureau has broken off communication with CAIR until "certain issues" are addressed by CAIR national leaders. The other, an April 28, 2009 letter from FBI congressional liaison Richard Powers to U.S. Senator Jon Kyl, is more specific: "[U]ntil we can resolve whether there continues to be a connection between CAIR or its executives and HAMAS, the FBI does not view CAIR as an appropriate liaison partner," Powers states. The IPT analysis further notes that CAIR was named as an unindicted co-conspirator in the government's case against the Holy Land Foundation for Relief and Development (HLF), and that FBI Special Agent Lara Burns labeled CAIR as a front group for Hamas at the HLF trial in October 2008. "We unequivocally condemn terrorism," CAIR proclaims, adding that "any group that hurts civilians deserves condemnation." Indeed, the group says, "our track record of success solidly repudiates extremist arguments that Muslims cannot get fair treatment in our nation." CAIR lists examples of what it terms its history of "principled advocacy for just and peaceful resolutions to conflicts even when that advocacy requires stances that are not viewed as politically correct." It further notes that it issued a statement on March 11, 2009, declaring, "We unequivocally condemn all acts of terrorism, whether carried out by al-Qa'ida, the Real IRA, FARC, Hamas, ETA, or any other group designated by the U.S. Department of State as a 'Foreign Terrorist Organization.'" But the IPT analysis provides multiple examples of "CAIR officials being directly asked about Hamas and Hizballah, only to see them duck the question or stubbornly refuse to condemn either terrorist organization." It quotes, in full, evasive answers given to interviewers by Awad, CAIR spokesman Ibrahim Hooper, CAIR Legislative Affairs Director Corey Saylor and CAIR-Chicago's Ahmed Rehab showing unequivocally that CAIR officials have adamantly refused to condemn Hamas or Hizballah. Awad himself, notes the IPT dossier, has expressed explicit support for Hamas. And CAIR Michigan Executive Director Dawud Walid, it notes, downplayed the threat of Hamas rockets fired at Israel, terming them "a few cheap, homemade, makeshift rockets being fired across the border." IPT rejects the argument that CAIR's success debunks "extremist arguments that Muslims cannot get fair treatment in our nation," declaring, "the notion that the U.S. is unfair toward Muslims often is at the heart of CAIR's message." It cites CAIR's critical reaction to a string of prosecutions of Muslims accused of helping finance terrorist groups, including those of HLF, a "Virginia jihad" network, and Florida professor Sami Al-Arian -- an admitted supporter of the Palestinian Islamic Jihad. Stating that "the majority of CAIR's financial support comes from American Muslims." The group defends itself against complaints of an undue reliance on overseas funding by suggesting it is no different in this regard from many groups -- including the government itself. "The U.S. government, corporations and many other non-profit organizations -- such as the American Red Cross -- routinely receive money from foreign nationals," it says. IPT's response focuses detailed attention on no fewer than five overseas missions by CAIR officials to solicit money, "including at least two trips abroad in 2006 seeking millions of dollars… from wealthy Gulf donors." CAIR assails criticism of its co-founder, Awad, for a March 1994 statement in which he declared his support of the Hamas movement -- partly on the grounds that he made his comment seven months before Hamas' first suicide bombing and nine months before the government identified Hamas as a specially designated terrorist. That defense, the IPT rebuttal notes, ignores the fact that the Hamas charter, rejecting peace initiatives and declaring Jihad to be "a duty binding on all Muslims," was issued in 1988 -- and was distributed by the IAP while Awad was an officer of that group. Moreover, the rebuttal adds, Awad had participated in a secret meeting of Hamas supporters in Philadelphia in September 1993, called to discuss ways to derail U.S.-led peace efforts opposed by Hamas. 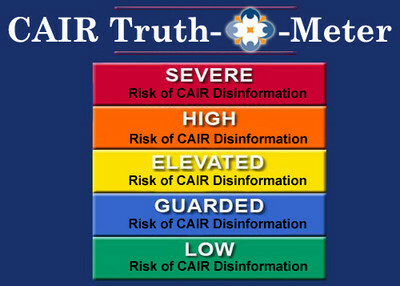 CAIR describes efforts to discredit it by reporting on terrorism-related activities by its former employees and board members as "McCarthy-like" guilt by association tactics. "CAIR has hundreds of board members and employees and thousands of supporters. It would be illogical and unfair to hold CAIR responsible for the personal activities of all these people," it contends. The IPT analysis responds that this line of argument would be valid "had CAIR been tainted by an isolated case or two." But in this case, it says, "CAIR misleadingly explains away the arrests of four of its employees and fund raisers while ignoring at least three other cases. That CAIR expresses no concern about this volume says plenty about the organization's ability to be candid about itself." CAIR concludes by arguing that it "represents a minority in the United States that is often treated as suspect and frequently subjected to discrimination," and that it pursues a "mission of promoting justice and mutual understanding." Its detractors, it contends, are "nativists, bigots and those who seek to profit from the Islamophobic 'fear industry.'" In order to deflect attention from its support for terrorism and radical Islam, CAIR makes wild and unsubstantiated accusations about its critics. As the IPT memo notes, however, the statements and actions made by CAIR in support of terrorism, all annotated and backed up with specific evidence, shows that CAIR is part of the support network for terrorism in the United States. To read the full version of CAIR's claims and IPT's point-by-point response, click here.